Many practices face EHR challenges with functionality or support that can frustrate physicians and staff. Others may not have a vendor that can support the practice’s long term population health or interoperability strategies. Practices need a trusted vendor that supports their needs of today, while also helping them to reach their goals of the future. 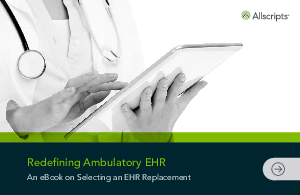 This ebook was created for practices ready to analyze the root causes of underperforming EHRs and develop a checklist of criteria for selecting a vendor that is right for their practice.